Do you dream of cooking bacon that doesn’t shrink to half its size once its cooked? Does your bacon loving friend wish there was a better and cheaper way to make 1kg of bacon to eat all in one day? 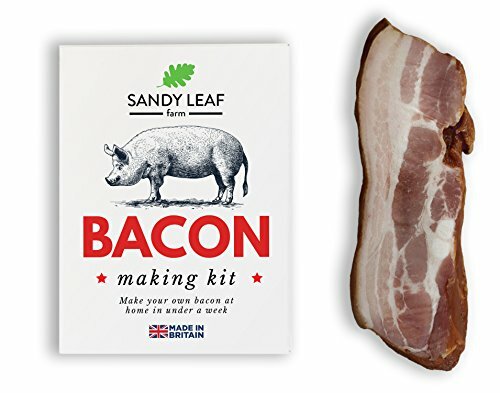 If so then this bacon kit is for you! After making your own bacon we promise you’ll never go back to store bought again. With this kit you can make a whole kilo of bacon from either pork belly or pork loin. The recipe is simple and clear, and the whole process only takes less than a week from start to finish. We’re also on hand to answer any questions you might have through the whole process. If you have any questions about this product by Sandy Leaf Farm, contact us by completing and submitting the form below. If you are looking for a specif part number, please include it with your message.